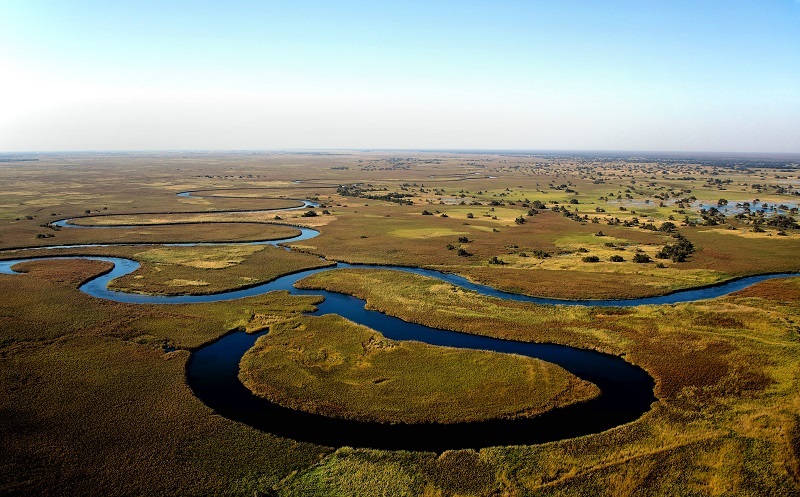 I never knew what the Okavango Delta was until Scott started getting excited about it. On our original itinerary for our African Tour, it was an optional extra so I glossed over it in an attempt to save money! It changed to an included extra so we had to pay around £150 to add it to our schedule. The Okavango Delta is a massive area of grassy swampland in the north of Botswana. It spreads across nearly 11,000 miles and floods every year so the hippos, elephants and crocs are super happy to chill out there. As part of our tour, we were spending a night on one of the many islands which are accessible by the local “Mokoros”. 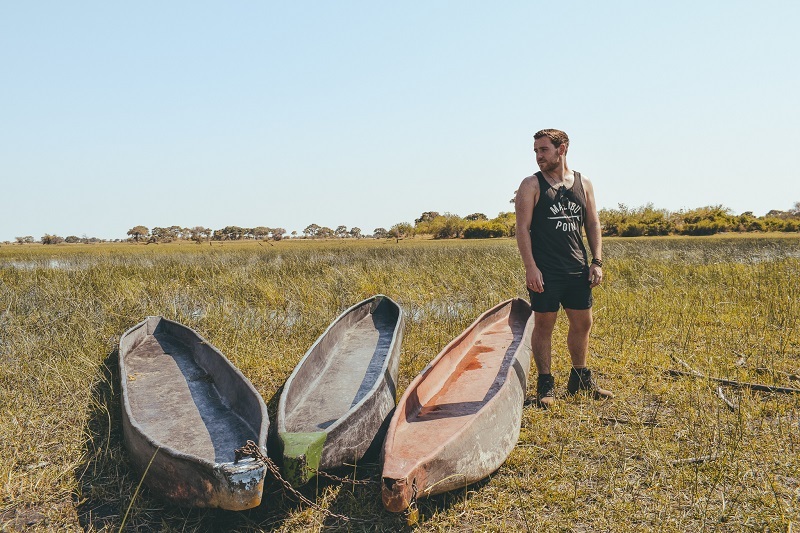 A Mokoro is a dugout canoe the local people use to navigate the shallow water channels across the Okavango Delta. After being hit in the face with a few branches and a few nips from the odd acacia tree, we arrived ready for departure. We split our group into twos and were each supplied with an ore-man (or “Poler”) to steer the Mokoro. As we set off, the excitement started to take over and we started taking heaps of pictures. Everyone pushed off at the same time so it felt like a rush to get to the front of the queue! The delta is extremely relaxing. After the excitement calmed down, all I could hear was the slow splashes of the ore, the birds in the trees and the odd noise from the hippos. I was running my hand through the water and touching all the water lilies. It felt almost meditation-like so I consciously closed my eyes and tried to take everything in so I can remember it. Being somewhere like that, with the silence of nature, is everything I need to self-assess and be mindful. I actually thought “omfg I’m actually doing the thing I’ve seen in National Geography!”. The Mokoro ride was around half an hour long before we reached the shore of our campsite. Our tents had been pre-erected by the polers and were nicely nestled in the shade of the trees (what a godsend for the ginger in me!). They had dug out a bush toilet in the form of a deep hole about 30 metres away from the nearest tent, which luckily, wasn’t ours! A fire had already been started and we had some chill time to unpack, take some pictures of the area before having our classic lunch of salad wraps. After we gobbled the wrap, we sat and had a little team pow-wow while our food digested. Our entertainment came in the form of watching a spider and a wasp brawl until the wasp stung the spider then laid eggs inside it before flying off. Almost as entertaining as watching the candle burn out in Lesotho! After a few adrenaline-filled minutes, we decided to take a dip in the crocodile, hippo and elephant infested waters of the delta. Luckily, our polers checked the small body of water for any wayward crocs before letting us take the plunge... After the all clear, we made our way in one by one. The water was strangely a mix of warm and cold. We accused almost everybody of peeing in the delta before we concluded that the shallower water heated up then moved around with the current. Although, I still believe there were a few pairs of pee-soaked swimwear in that delta. Once we dried off, we headed back to the campsite to relax and wait for the sun to drop before embarking on our bush walk. The guide took us aside for a little briefing before we left the camp. He told us what to do if we encounter lions (just walk away with eye contact apparently), elephants, rhinos and leopards and it gave me the heebie jeebies! I started to imagine scenarios where I’d come within 2 feet of a lion, tickle a hippo’s ears and get lifted up by an elephant’s trunk. Fortunately, the scorching heat of the delta snapped me out of it and suddenly we were plodding around open land in single file with zebra running away from us and elephants within throwing distance. The landscape changed from burnt grass, to sand then to crunchy twigs (love the crunch). Once we witness one of the best African sunsets, we made our way back to our campsite. For dinner, it was pup (also known as nshima) with some spinach, veg and a meat stew – a classic African meal! We wolfed down our portion (I had the veggie option because I’m picky!) and cracked open a bottle of red vino. It was a $3 bottle we picked up in Zambia after a recommendation from my new travel pal, Ryan. We grabbed a few chairs and took them down to the water to admire the stars without all of the light pollution. The stars were awesome and we saw so many shooting stars and planets – it was unreal! Scott managed to get a great pic of the night sky which showed the Milky Way and all the twinkling stars. Honestly, I’ve never seen stars twinkling before until I saw them in the delta. The polers entertain their clients on the last night of the tour so we sat around the fire and enjoyed their performances of African songs and some groovy dancing. They grabbed a few of the guys up to perform which was hysterical. Especially after a bottle of red wine! We played a few games with the group and roasted our marshmallows on the fire. My first time making schmores went down a treat! I had 4 and had to stop myself before I made myself sick with sugar. “If you shine your torch and see red or yellow eyes, stay in your tent. If you see green or blue eyes, go with caution”. I quickly scoured the bush and ran back into my tent when I started imagining lions stalking me. Luck was on my side because I didn’t have to pee during the night and made it through to 6am with all of my limbs and without a scratch – just a few mosquito bites! I had woken up during the night and heard lots of animals squawking and chatting and was almost too awe-struck to go back to sleep. Almost! I was absolutely knackered after our bush walk and all the excitement of the Mokoros. 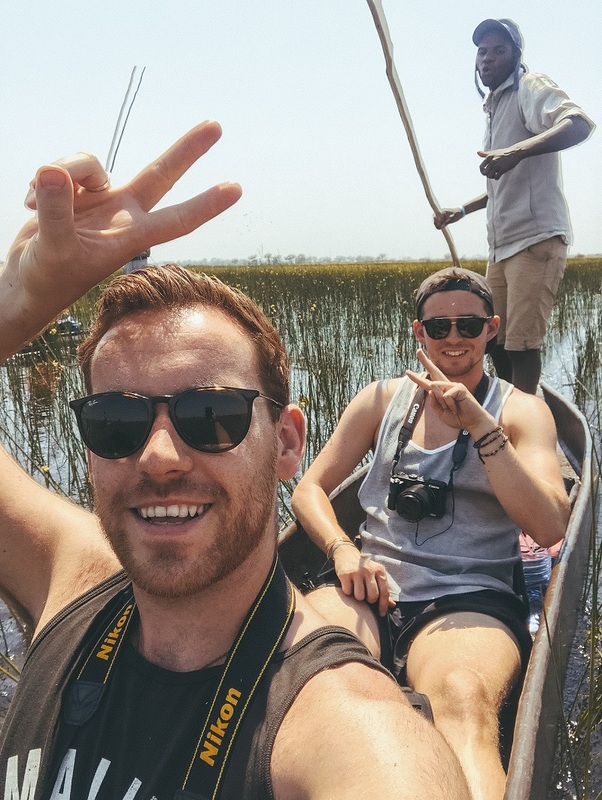 We departed the island around 7am and had the most peaceful mokoro ride ever – I almost fell asleep between having deep conversations with Scott and listening to all the sounds of the Delta. 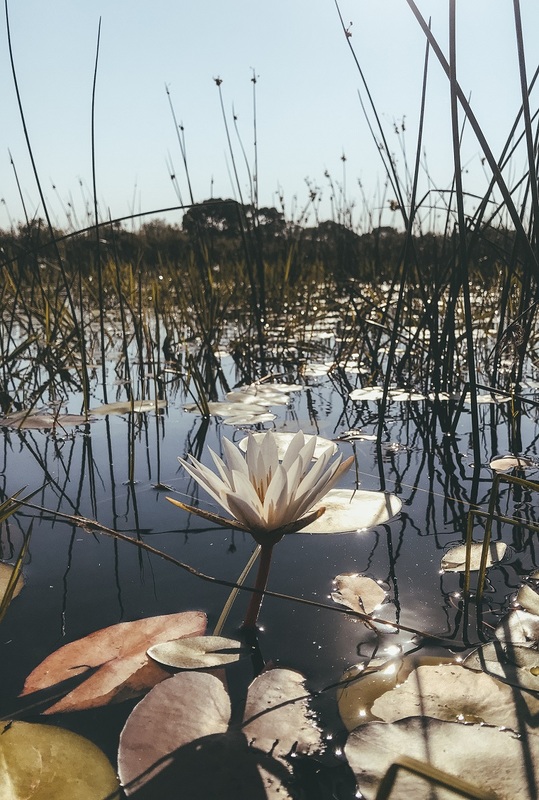 Our trip to the Okavango Delta was everything I’d imagined. I’d definitely recommend it for the thrill of sleeping with the wild animals and the chill of the mokoros and “being one with nature” (and I don’t mean the bush toilet!). How to Meditate Like A Man.